Two structures define Sydney’s skyline: the Opera House and Sydney Harbour Bridge. While you may have heard of Bridge Climb – walking over the bridge’s arch to the summit – there's also a completely free Sydney Harbour Bridge walk with equally unmissable views. We’ve tried all three options and while they each offer amazing views, there are differences to discover which Sydney Harbour Bridge walk is best for you. Like San Francisco’s Golden Gate Bridge, the walk over Sydney Harbour Bridge can only be accessed from one side (the other is reserved for cyclists). Luckily, walkers have the eastern side with the most iconic views, including the Opera House, The Rocks and Fort Denison. How long is the Sydney Harbour Bridge walk? From Bridge Stairs in The Rocks (see details below), all the way across the Harbour Bridge to Milsons Point, it’s a 20 minute walk, one way (that’s assuming you’re not stopping for photos!). The Sydney Harbour Bridge Walk is actually part of the longer Cahill Walk – the bridge is the northern section – and if you did the whole lot it’s still only a 45 minute stroll. Free! Seriously, this has got to be one of the best free things to do in Sydney. Starting from the city, the best access point is the Bridge Stairs on Cumberland Street in The Rocks. The Bridge Stairs are between the Glenmore Hotel and The Rocks YHA / Big Dig archaeological site. Bridge Stairs, The Rocks. Access point to the Sydney Harbour Bridge walkway. Outside the Bridge Stairs on Cumberland Street, near the Glenmore Hotel, with a view to the Harbour Bridge. Going straight up the stairs from Cumberland Street (NOT using the subway tunnel across to Fort Street), means you're on the correct eastern side to do the Harbour Bridge walk. But keep in mind this subway goes to Observatory Hill for another adventure later! The Bridge Stairs are historic and spacious. There are two new sets of access lifts to improve accessibility for people in wheelchairs and people with prams. One is at Cumberland Street, The Rocks (just up from Bridge Stairs), and the other is at the Kirribilli / Milsons Point end. The new lifts are in addition to one at Circular Quay, and a ramp from the Royal Botanic Gardens. 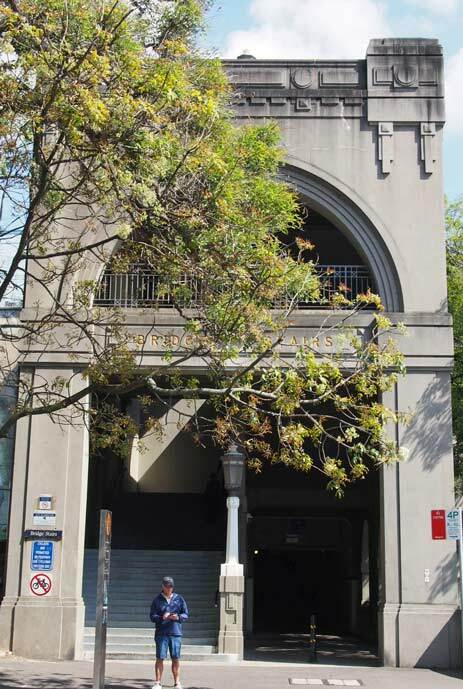 Here are more details about alternative access points to the Harbour Bridge walkway. The views from the Harbour Bridge walk are fantastic but limited. The pedestrian walkway offers 180 degree views over the harbour (hello Opera House!). You are walking right next to a seven lane highway so cannot see anything to the west. High safety fences can also obstruct views. Getting arty through the Harbour Bridge fence. The video featured on this page was taken from the Harbour Bridge walk, so you can see the views are still worthwhile. Up close to the Harbour Bridge. Is it worth walking the whole way across Sydney Harbour Bridge? If you only have a short time, then walking the 10 minutes or so to the first pylon (home to the Pylon Lookout – details below) will provide enough views of the harbour and Opera House to satisfy. But if you have time, it's worth walking the whole way across. By walking over the Harbour Bridge, not only can you say you've done it, but you'll also end up at Milsons Point – a place popular with locals with unique views of the bridge and Opera House. Milsons Point is on the northern side of the bridge. (If you'd like to start your walk here, read instructions on the Cahill Walk, which is the proper name of the Sydney Harbour Bridge Walk). Turn left onto Alfred Street, staying on the left side of the road (passing underneath the “Luna Park, Olympic Pool” sign). The Luna Park sign at Milsons Point, next to Bradfield Park. This is Bradfield Park, a grassy expanse underneath the northern end of the Harbour Bridge, with views across the water to Sydney Opera House and the city. Views of the Opera House underneath Sydney Harbour Bridge at Bradfield Park, Milsons Point. Either have a picnic in Bradfield Park, or grab takeaway from one of many cafes in Milsons Point. For a fancier long lunch, go to the end of Alfred Street for superb views from Ripples, a licensed cafe overlooking the bridge and harbour. Walk right down to Milsons Point ferry wharf at the end of Alfred Street for amazing views of the Harbour Bridge and Opera House. Views of the Opera House underneath Sydney Harbour Bridge near Milsons Point ferry wharf. The south-east pylon of the Harbour Bridge is open to the public every day (except Christmas Day). It houses the Sydney Harbour Bridge Museum with interesting facts about the Harbour Bridge’s history, structure and build. Wax figures in the Pylon Lookout demonstrate the complete lack of safety equipment during the Harbour Bridge's build. But really, the main reason to pay for entry is to access the Pylon Lookout. Far out! 360 degree views of Sydney Harbour. Sydney's north. The green headland is Admiralty House, home to the Governor-General. And there are views over the Harbour Bridge itself (and a birds eye view of people doing Bridge Climb as you’re higher than halfway up the bridge). Be warned: there are 200 stairs to get to the top of Pylon Lookout. It’s like climbing a belfry or church tower – the stairs are inside the pylon, with no windows or external views until you get to the top. A raised ledge at the top of the Pylon Lookout enables views over the Pylon's parapet. The Pylon Lookout costs $15 for adults, $8.50 for children 5-12 years, and is free for kids 4 and under. (Prices correct at time of writing, check latest prices). The Bridge Pylon Lookout is a short walk along the Harbour Bridge walkway, about 10 minutes. The Harbour Bridge walk passes through the pylon. It is the only pylon with doors and Pylon Lookout signage. From the Pylon Lookout, it’s a further 15 minutes walk to Millers Point, the northern side of the Bridge. The Sydney Harbour Bridge Climb is a once-in-a-lifetime experience, and not just for tourists. I was chatting recently with a bunch of friends – all born and bred Sydneysiders – and they'd all either done Bridge Climb or wanted to go. We've been and loved it (look at my ridiculous grin)! The only downside is that it's fairly expensive (about $260 AUD) and you can't take your own camera or photos. Check prices and book Bridge Climb here. Just by doing this walk, you've ticked off one of the 1001 Walks You Must Do Before You Die. There are three more walks in Sydney that qualify. Tagged 1001 Walks, Sydney City, Sydney Harbour Bridge.